Chinese painting came a long way during the 300-year period that saw the rise and fall of the Three Kingdoms (220-280), Jin Dynasty (265-420) and Northern and Southern Dynasties (420-581). Apart from the chaos of war and dynastic changes during this period, active intellectual life of different schools also provided a great impetus for artistic development. Well-known grotto murals, tomb paintings, stone carvings, brick carvings and lacquered paintings were produced at the time, and a number of virtuosos emerged in Chinese calligraphy and painting. Certain painting theories, such as the Graphic Theory and the Six-Rule Theory that form the theoretical basis for present-day Chinese painting, were also put forward. Gu Kaizhi, known as the founder of traditional Chinese painting, and his scroll paintings, represented the painting style of the period. Gu was born into an official family in Wuxi, Jiangsu Province and served as a government officer at a young age. Having toured many beautiful places, Gu was proficient in writing poetry and essays; Chinese art history abounds in anecdotes about him. When the construction of a temple was planned for Jiankang (Nanjing) and the monks and abbot could not collect enough money to build it, a young man offered to donate a large sum of money. He suggested he would draw a picture of the Buddha on the wall and, in the process, collect donations from curious passersby. For three consecutive days, thousands of people flocked to see the young man at work. By adding the final touches to the picture, the Buddha seemed to come alive, and the viewers cheered and applauded the young man's artistry. Hence, the money needed for the consummate construction of the temple was obtained. The young man who paid great attention to the details that revealed the characteristics of his subjects was none other than Gu Kaizhi. Gu was once was asked to paint Pei Kai's portrait, a man with three, long, fine hairs on his face that had been ignored by other painters. Gu laid great emphasis on the three hairs, and Pei was very satisfied. Another time, Gu painted a man named Xie Kun standing in the midst of mountains and rocks. When asked the reason for the setting, Gu explained that Xie loved to travel and see beautiful mountains and rivers. Such stories demonstrate Gu's skill of creating atmospheres that enhanced the characteristics of his subjects. The theme of the Luoshen Appraisal Painting (luo shen fu) was drawn from the article, Luoshen Appraisal, written by Cao Zhi, son of the Wei Emperor Cao Cao. 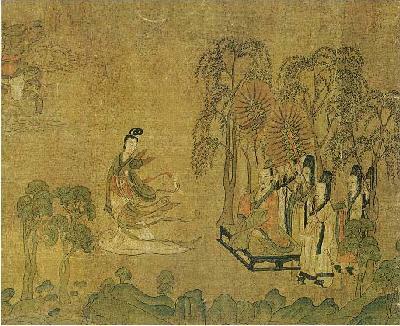 The painting depicts the meeting between Cao Zhi and the Goddess Luoshen at Luoshui River, vividly capturing the mood of their first meeting and eventual separation. Gu emphasized his subjects' expressions, with the stones, mountains and trees having an ornamental purpose. 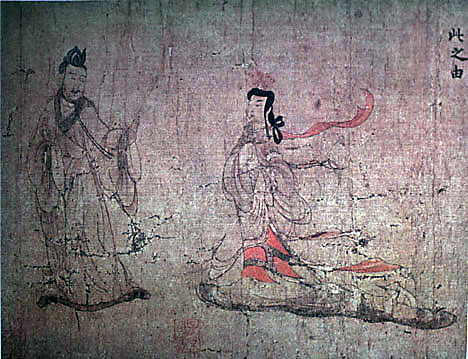 Gu's paintings, which greatly influenced later traditional Chinese paintings, are similar in style to the Dunhuang murals. Gu Kaizhi also made great advances in summarizing painting theories. His theoretical works included Painting Thesis and Notes on Painting Yuntai Mountain. Gu paid considerable attention to the vivid expressions of his subjects to expose their spirit. His Graphic Theory later became a basic theory for traditional Chinese painting. According to historical records, Gu created more than 70 paintings based on historical stories, Buddha, human figures, birds, animals, mountains and rivers. His three existing scroll paintings include the Nvshi Zhen Painting, Luoshen Appraisal Painting and Lienv Renzhi Painting -- the earliest examples of scroll paintings.